U.S. stocks rebounded Thursday, as a drop in jobless claims and the European Central Bank's interest rate cut fueled optimism on Wall Street. 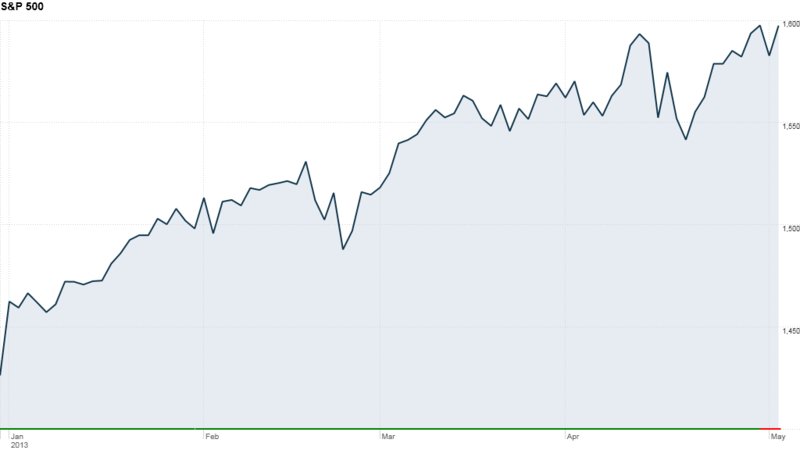 The Dow Jones industrial average rose more than 130 points, or 0.9%. The S&P 500 rose 0.9%, to close within a couple of points of 1,600. The Nasdaq added 1.3%. to its highest level since November 2000. 1. Jobless claims fall to 5-year low: First-time claims for unemployment benefits fell to the lowest level since January 2008, surprising economists who were expecting an increase and possibly signaling improvement in the job market. The good news comes ahead of the government's key monthly jobs report due Friday. Economists surveyed by CNNMoney are expecting the report to show the economy added 140,000 jobs in April, up from 88,000 in March. They're expecting the unemployment rate to remain at 7.6%. 2. ECB cuts rates to record low: The ECB cut its key interest rate for the first time in 10 months in a bid to prevent the eurozone from falling even deeper into recession. The central bank was under intense pressure to cut rates. European markets were mixed in afternoon trading, but had been rallying since mid-April in anticipation. The ECB's move follows the Federal Reserve's decision Wednesday to keep buying $85 billion worth of bonds a month, as part of its effort to stimulate the recovery. The central bank pointed to a high unemployment rate and low inflation as reasons to maintain its pace. The Fed said it stands ready to either "increase or reduce the pace" of those purchases in response to economic activity. 3. GM is doing a little better in Europe. General Motors (GM) shares jumped 3% after the automaker's earnings showed progress in stemming losses in Europe, where a worsening recession has resulted in the worst industry-wide auto sales on the continent in 20 years. GM CEO Dan Akerson pointed to cost-cutting measures and the successful introduction of new models for the improved performance. 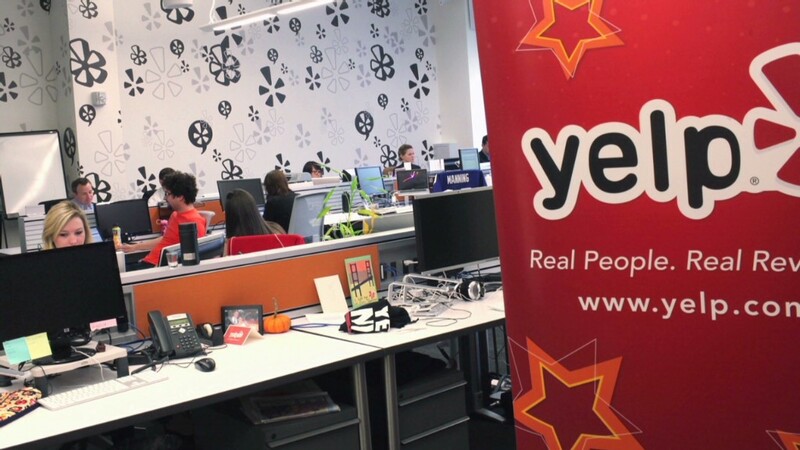 In other earnings news, Yelp (YELP) shares surged 27% after the review site reported a narrower loss and sales that topped estimates. Facebook (FB) shares rose 5% after the company's sales jumped 38% in the first quarter, boosted by its growing mobile ad business. Facebook investors are laser-focused on mobile, which the social media company has said is the key to its future success. After the closing bell, AIG (AIG) reported a profit that topped forecasts. Shares of the insurer rose in extended trading. But shares of social media company LinkedIn (LNKD) plunged after hours even though the company reported profits and sales that topped forecasts. Investors were disappointed by the company's guidance. Expectations were high. LinkedIn's stock hit a new peak in regular trading. 4. ING makes debut on Wall Street: Shares of ING (VOYA) rose 7% on their first day of trading on the New York Stock Exchange. The U.S. arm of the Dutch bank raised $1.3 billion in its initial public offering, which priced below the expected range. 5. Intel gets a new CEO: Intel (INTC) said that Brian Krzanich, currently the chipmaker's chief operating officer, will become the company's new CEO on May 16. Current CEO Paul Otellini announced in November that he would be stepping down this month after 38 years at the company, the final eight of which Otellini was at the helm.